So Ms Possum has arrived in Riyadh and chauffeur driven to the Al Khozama Hotel. The wonderful Ms L coincided briefly there and went through the action-packed itinerary that would see them through the next few days and then it was Pumpkin time; ie: time for all good possums to hit the hay. Ms Possum was not to be phased and happily chatted away to the curious waiters as if this was the most natural thing in the world for her. The whole team of all male hotel staff got used to the irrepressible Ms Possum and came to expect a cheery Hello from her. They remembered how she liked her eggs; were surprised when she asked about their lives; totally intrigued how a lone girl had come to Saudi Arabia to do business and blown away when they realised which Prince had sponsored the visit. They became quite protective of Ms Possum in ensuring she got into the right car and was safe and the little posy of flowers as a farewell was a touching gesture. We’ve just got in the scrummiest new hides for one of our discerning clients and look what we’ve made – a dramatic reversible raw edge bed throw that nonchalantly drapes over a settee or bed with unabated elegance. This throw has a chocolate suede reverse with a dark wash over the natural possum fur to give a depth of colour and texture that really epitomises the best in luxury décor. Turn back a corner; completely reverse it, or wallow in the sheer fluffiness of a few dozen pelts – the choice is yours. We will quote in any size and colour – simply email us your requirements as we are carrying out an increasing amount of custom work. For some other examples of our gorgeous throws, click here, or check out more of our custom work at Flickr. We’ve just finished a couple of decor commissions for clients who wanted something a little different! The first one is a white, queen size Possum fur throw. Because of the bleaching process we had to be super-careful during construction and reinforce everything. The result looks fantastic, and we could totally imagine it in an ultra-modern bedroom. 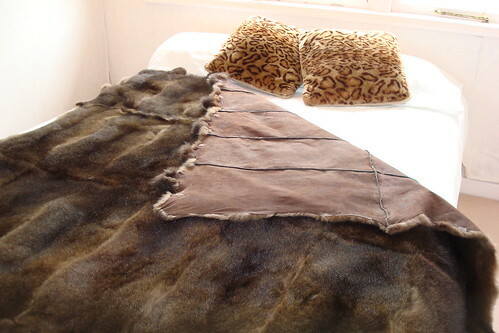 The second design was a little more rustic — a tri-colour Possum fur throw. Our client couldn’t decide which shade of natural she liked best — so chose them all! The finished throw looks amazing. The tones in the natural grey hides makes the reddish parts of the natural brown really pop! If you’d love something special, but can’t find it on our site, get in touch with us and we can discuss your options.